The Space: A sunroom in a two-story Uptown Minneapolis house. Selling Points: Bright, west-facing windows, original woodwork, beautiful French doors. Drawbacks: Dated carpet, vinyl blinds and flat-white walls. "This house still has all of its original woodwork, which will be very appealing to buyers," said Lori Matzke of Centerstagehome.com. "We wanted to make sure those features really popped and the space felt as warm and sunny as possible." The side table/ lamp combo was placed in storage and a dated occasional chair that had been covered with a large throw was given away, as was the afghan on the couch. Selling tip: To free up space, get rid of anything you don't plan to take with you before putting your house up for sale. Matzke removed the dated rubber-back carpeting to expose the original hardwood floors. Damaged areas were lightly sanded and then stained to match. Two applications of lemon oil helped bring back the floor's original luster. Selling tip: Even though the stain and finish on the floors were not in perfect condition, the wood itself was flawless. Matzke suggests revealing the wood, which has much more appeal than dated carpeting. 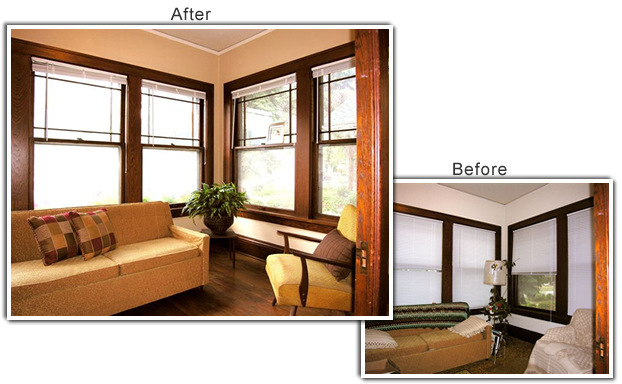 The windows were cleaned and the shades pulled wide open to flood the room with natural light. Shortening the cords gives the windows a neater look. Glass replacement shades were removed from the original ceiling fixture (not shown) to lighten up the space even further and show off the fixture. Walls were washed and painted (two coats) a medium shade of beige with a mix of golden and reddish undertones ($20 per gallon) to play up the woodwork and warm up the space. Because the room is so sunny, using a deeper neutral color on the walls keeps them from looking too washed out. A chair that matches the vintage sofa-bed was found in an upstairs bedroom and brought in to create a conversational area without adding too much bulk. A small side table set at an angle in the far corner and topped with a lively green plant in a wicker basket draws the buyer's eye into the room. Silky patchwork pillows ($15 each) in shades of gold, sage and cranberry add color and help update the sofa. A quilted pillow in brown velvet ($6) softens the matching chair. A small contemporary photo in an antique silver frame on the window sill subtly draws the buyer's eye to the charming window muntins.